Except for the archery motif, the "Green Arrow & Speedy"
series sounds like a direct swipe of Batman and Robin. They took the archery motif from Fawcett's Golden Arrow, but more directly from a minor hero from a minor company, called simply The Arrow. But the prior hero he most precisely resembled was Tom Hallaway, alias The Spider. Green Arrow was created, if that's not too strong a word, by Mort Weisinger, editor of DC's More Fun Comics, who introduced the crime-fighting archer in the 73rd issue of that title (November, 1941) — the same one that first featured Aquaman. George Papp illustrated that initial outing, and remained the character's principal artist for many years. Green Arrow was never as strong a character as the one he was modeled after. Whereas Batman appears intensely motivated — driven, even — Oliver Queen, the man who masqueraded as Green Arrow (Roy Harper, his ward, was Speedy), seemed merely to dabble in crime-fighting. Still, Green Arrow was a modest success. Six months after his introduction, he ousted Dr. Fate from the cover of More Fun, and held it, with a few exceptions, until 1946, when he lost that spot to a humorous pair of identical twin detectives, Henry Boltinoff's Dover & Clover. After he'd been around a year or so, Green Arrow got an additional berth in the back pages of World's Finest Comics, which at the time was an anthology comic that anthologized features from other anthology comics. (Its stars, appearing on every cover, were Superman and Batman.) He held on there for over 20 years. He was also a member of The Seven Soldiers of Victory, a sort of second-string Justice Society of America, for the entire time of that group's existence (1941-45). In 1946, the superheroes of More Fun Comics moved en masse to Adventure Comics, leaving More Fun to Curly's Cafe, Genius Jones and other humor series; and displacing all of Adventure's features except The Shining Knight. 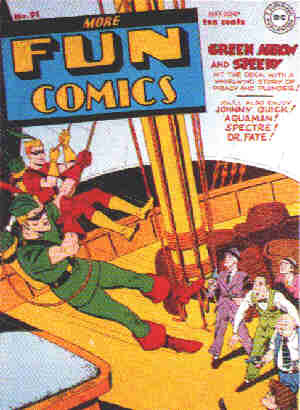 After the switch, the content of Adventure remained fairly constant for a long time, and Green Arrow held on to his slot in the back pages until 1960. In all that time, however, he appeared only once on its cover — as a boy, in a 1959 crossover with Superboy. The only highlight of the run was a brief stint (1957-58) in which the series was drawn by Jack Kirby (creator or co-creator of Captain America, Challengers of the Unknown and many others). When superheroes started coming back, and the new Justice League of America was being manned, Green Arrow was somehow overlooked. But he became the first non-charter member of that organization, joining in its fourth issue (Apr-May 1961). In the mid-'60s, he lost his spot in World's Finest Comics, and his Justice League appearances were the only thing keeping him in the public eye. That's when writers started playing around with him. He lost his fortune and developed a social conscience and prickly demeanor. He sported a new look, with a thonged tunic and a yellow beard. Speedy made his own way in the world, and later turned out to have become a junkie! All of a sudden, Green Arrow didn't look like a Batman clone anymore. In 1970, he landed a new gig — he co-starred with Green Lantern in a series of critically-acclaimed but commercially-flat comics where the super villains were replaced by slumlords, corrupt religious leaders, and oppressors of native peoples. This series lasted two years. He re-teamed with Green Lantern a few years later, although their foes this time were of a more conventional sort, and made an occasional guest shot with other DC heroes. It was during this period that he first became intimate with The Black Canary, the female superhero who became his life partner. Green Arrow was the subject of his first mini-series in 1983 — and due note was made of the fact that this was the first time he'd ever appeared in a title of his own, after over four decades in comics. Another mini-series followed in 1987, and he finally got his own regularly-published, ongoing series in 1988. Since then, he's been killed off and replaced by a younger character calling himself Green Arrow, then de-killed (courtesy of his old pal, the former Green Lantern who had become the almighty Spectre while somebody else was doing his old job) and put back in his own title again. But that's pretty much how it goes in comics these days.